American writer and historian of Afghanistan Nancy Hatch Dupree died in Kabul on September 10, 2017, after complications from an injured leg and failing heart and lungs. She was nearly ninety years old. Nancy and her archaeologist-husband, Louis Dupree were witnesses to the transformation of Afghanistan from the post-war modernization of the central government to the “all in the family” coup d’etat in 1973 that made his cousin, Mohammad Daoud the first President of Afghanistan to the Soviet backed puppets, Nur Mohammad Taraki (1978) and Hafizullah Amin (1978 – 1979). The Duprees left their home is Kabul only after Louis was arrested in 1978 after being accused of being an American spy. From then on, they lived part time in the US and part time just over the border from Afghanistan in Peshawar, Pakistan. Nancy became an activist in the swelling refugee community, working to recover documentary materials and art flowing out of the country during the years of the Soviet invasion and mujahedin resistance. Nancy returned to Pakistan after Louis died in 1989 and, as soon as it was possible, to Afghanistan, in order to work on her primary goal, the creation of an historical, cultural, and archaeological archive for the nation. In so doing, she was single-minded, determined, stubborn and sometimes difficult – but she long outlived the opponents who forced her from Afghanistan, and the archives she helped to found are a true achievement not just for her, but for the nation of Afghanistan. Nancy Dupree’s in-depth understanding of Afghanistan and its people left her free from some of the prejudices of archaeologists and cultural theorists who live in an idealized, fantasy world where making laws on paper actually effects local conditions. She understood that involving local communities in protecting monuments was the only way to be successful. She advocated for broad public education, especially in rural districts, as the key to community-based heritage preservation. While living in the refugee community of Peshawar, Nancy Dupree was a founder of the Society for the Preservation of Afghanistan’s Cultural Heritage (SPACH), and when she returned to Afghanistan, she traveled all over the country to build support for the preservation of Afghanistan’s history. Finding international safe harbor for artifacts became a popular idea globally in response to the destruction that decades of war had caused to Afghanistan, but Dupree found UNESCO impossible to work with. First and foremost, however, Nancy Dupree was a tireless advocate for building knowledge within Afghanistan and for assisting in the development of an academic and research community that would carry on historical, anthropological, social, and political scholarship on Afghanistan by the Afghans themselves. Nancy Hatch was born in Cooperstown, N.Y. in 1927 and was raised in India. Her parents were both deeply involved in Asian culture and Nancy Hatch herself received a master’s degree in Chinese art from Columbia University. She first arrived in Afghanistan in 1962 as the wife of a diplomat, falling in love with both the culture – and later, with archaeologist and anthropologist Louis Dupree. 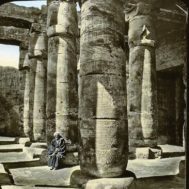 Her husband at the time fell in love with Louis Dupree’s then wife, and the “switch” that took place when the couples were living in tents on site became a part of Afghan legends about the strange habits of these exotic foreigners. My husband and I first met the Duprees at just such a party, where I remember asking them a serious question about identifying pottery shards and Nancy replied that she would touch it, rub it, smell it and taste it – an unorthodox answer but quite a sensible one. My husband had found the earliest surviving movies made in Afghanistan, essentially ‘home movies’ made by someone in the family of Amanullah Khan, King of Afghanistan from 1924-1929 – on a pushcart stacked with brick-a-brac from the palace. The Hazara pulling the cart was a hard bargainer, and my husband only had enough afghanis to buy half of the reels. We worked with the Duprees to copy the old films for the archives, for some obscure reason to hide their Land Rover in our yard when Louis was arrested, and helped to organize their household things for a sort of garage sale when they had to leave Kabul, they thought, for good. In addition to a guidebook about the Bamiyan Buddhas in 1969, she wrote four other books; one about Kabul, another about Herat and the northern area, as well as a guide to the National Museum of Kabul and finally a historical guide to Afghanistan. Her guide to the Kabul Museum, a tiny volume printed with grainy photos, became an irreplaceable resource when the Taliban smashed many of the museum’s contents with sledgehammers. When Ms. Dupree was forced to leave the country during the 1979 Soviet invasion of Afghanistan, she moved to a refugee camp in Peshawar to help Afghan refugees. While she was there, she worked to preserve both government and non-government documents related to Afghanistan’s history and culture during the Soviet invasion. These estimated 7,000 documents became the foundation for the Afghan Collection at Kabul University. She frequently returned to Kabul to meet with the Taliban to try and secure protection for both the libraries and the cultural artifacts of Afghanistan, negotiations that often ended in heartbreak as yet another site or monument was destroyed. According to Omara Khan Massoudi, the former director of Afghanistan’s National Museum, during the years (1996-2001) when the Taliban’s mission was to destroy cultural artifacts as un-Islamic, Ms. Dupree took active measures to help install 32 metal doors for the museum galleries to protect the surviving artifacts. Massoudi attributes the sentiment inscribed on a stone at the National Museum to her influence: “A nation stays alive if its culture stays alive.” In later years she frequently lamented the lack of cultural knowledge in the younger generation due to displacement in refugee camps from the years of war and occupation. “He’s got such a fantastic view,” Mrs. Dupree used to tell friends. 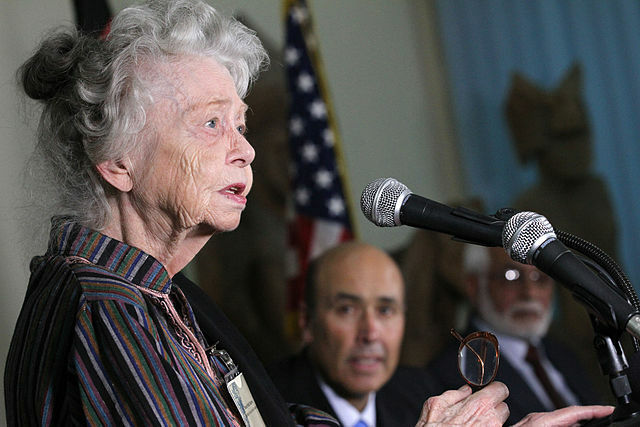 Nancy Dupree with be much missed – beloved by her adopted country and an honorary “daughter of Afghanistan,” as the Afghanistan Center at Kabul University described her in a statement on her passing. (*) These included some of the truly priceless, world famous, Begram ivories, stolen from the museum during the war and purchased in Pakistan for donation to SPACH by a UK art dealer.